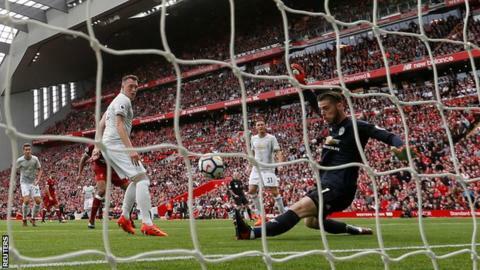 Manchester United keeper David de Gea produced a world-class save to deny Joel Matip as Liverpool were frustrated by Jose Mourinho's stubborn side at Anfield for the second successive season. Jurgen Klopp's side peppered the United goal with 19 shots but a combination of outstanding goalkeeping by Spain keeper De Gea and the home team's poor finishing denied them a decisive moment. The German's men were in control of the game for long periods but their profligacy in front of goal means they have now won just once in eight games. The most noteworthy incident of an uneventful first half was De Gea denying Cameroon defender Matip from close range with a brilliant reflex save with his outstretched left boot, before Mohamed Salah fired the rebound wide. United offered very little quality in attack although De Gea's counterpart Simon Mignolet had to smartly parry Romelu Lukaku's fierce attempt before the interval. Liverpool dominated even more after half-time but Emre Can wasted their best chance when he volleyed over the bar from eight yards after being picked out by the impressive Joe Gomez. The point leaves United - with nine clean sheets in their past 10 league games - two points behind Manchester City, who thrashed Stoke 7-2. It's almost a year to the day Liverpool and United played out a goalless and drab stalemate in the same stadium, with the hosts subdued by a vintage Mourinho masterclass in defensive organisation. Twelve months on, this game was only marginally better despite Liverpool taking the match to United with more urgency after the break than they mustered in 2016. A year ago, United were grateful for two fine second-half saves from goalkeeper De Gea to deny Can and Philippe Coutinho. This time the Spaniard produced a magnificent save with his foot to keep out Matip from close range on his way to his 18th Premier League clean sheet of 2017. This was only Liverpool's third clean sheet in 13 games this season but Mourinho will have been the happier manager at the final whistle. The visitors had just 38% of possession - a 3% improvement on their last visit - yet their dogged defensive display stopped Liverpool scoring for only the second time this season in the Premier League. Lukaku started the day as the Premier League's leading scorer yet, not for the first time, he failed to deliver against Liverpool. The powerful Belgium striker registered a shot on target - something he had not done in five of his past seven meetings against the Reds - when his compatriot Mignolet beat away his stinging first-half shot in front of The Kop. But this was largely a game to forget for the former Everton striker, who lacked the sharpness that had helped him to seven goals in his first seven league games for United. Lukaku managed just one touch in the opening 23 minutes and his frustration seemed to take over when he clattered into Matip and then his left foot appeared to catch Dejan Lovren - although he escaped a yellow card on both occasion. He ended the match with 22 touches, which was reflective of his own subdued performance as well as the modest attacking ambition shown by his team-mates as United's six-match winning run came to an end. Liverpool have now gone seven matches without beating United in the Premier League and were predictably hampered by the absence of Sadio Mane. Mane watched on from the stands, nursing the hamstring injury that is likely to keep him out of action until next month. While Salah was impressive on the right wing - especially in the opening period - the Reds missed the Senegal forward's pace, directness and finishing. The game in general lacked real attacking fluency from either side, with neither managing a single shot on target in the second half. Indeed, BBC Radio 5 live summariser Danny Mills labelled a "typical contest" after the international break. "If you have seven days to work with your team you can work on creativity, fluidity and attacking intent," said the former Manchester City defender. "If you've got two days after an international break then it's simply a case of getting solid as a unit. "You're all weary, you've all been travelling, so you simply need to ensure you get defensively solid." "It was a good performance, I thought worthy of three points. We were unlucky in at least two, maybe three situations - of course the big chance when De Gea made the save. "There were a lot of good individual performances. Even when the last few games for us were not perfect, we were clear and concentrated. "I felt the referee should have given us a penalty. Then, maybe, it was a red card with the Lukaku and Lovren situation. Two situations, with different outcomes producing maybe a different result. "We need to be creative and brave in a situation like we are in. We don't score easy goals anymore so the biggest challenge is not to lose confidence and we haven't." "A point, in this long marathon? A point at Anfield is OK.
"In the first half we had the ball and were always compact. We had a few shots in the second half." Jose Mourinho has won only one of his eight matches as a manager against Jurgen Klopp in all competitions (W1 D4 L3). Since Mourinho took charge of Manchester United last summer, these two clubs have won exactly same number of points in the Premier League (89). Liverpool and United have drawn three consecutive league meetings for the first time since 1921. United have equalled their best points tally after the first eight matches of a Premier League season (20 points), which they achieved in 2011/12 & 1999/00. Since Klopp took charge, Liverpool have won the most points in matches between the 'big six' in the Premier League (37 points). Liverpool turn their attentions to the Champions League, with a midweek Group E trip to Slovenia to face Maribor (19:45 BST) on Tuesday. United are also on their travels for Europe's elite competition as Mourinho returns to Portugal on Wednesday for a Champions League Group A game against Benfica (19:45 BST). Match ends, Liverpool 0, Manchester United 0. Second Half ends, Liverpool 0, Manchester United 0. Attempt missed. Joel Matip (Liverpool) header from the centre of the box is too high. Assisted by Alex Oxlade-Chamberlain with a cross. Corner, Liverpool. Conceded by Jesse Lingard. Substitution, Manchester United. Victor Lindelöf replaces Ashley Young. Attempt missed. Dejan Lovren (Liverpool) header from the centre of the box is too high. Assisted by Alex Oxlade-Chamberlain with a cross following a corner. Corner, Liverpool. Conceded by Ashley Young. Corner, Liverpool. Conceded by Chris Smalling. Substitution, Liverpool. Daniel Sturridge replaces Philippe Coutinho. Attempt missed. Mohamed Salah (Liverpool) left footed shot from outside the box misses to the left. Assisted by Jordan Henderson. Chris Smalling (Manchester United) wins a free kick in the attacking half. Attempt missed. Mohamed Salah (Liverpool) left footed shot from outside the box is high and wide to the left. Assisted by Jordan Henderson. Substitution, Manchester United. Marcus Rashford replaces Anthony Martial. Corner, Liverpool. Conceded by Matteo Darmian. Attempt missed. Emre Can (Liverpool) left footed shot from the centre of the box is high and wide to the right. Assisted by Joseph Gomez. Attempt missed. Georginio Wijnaldum (Liverpool) right footed shot from the centre of the box is high and wide to the right. Attempt blocked. Philippe Coutinho (Liverpool) right footed shot from outside the box is blocked. Assisted by Roberto Firmino. Two years of Klopp - are Liverpool better? Read more on Jurgen Klopp: Liverpool boss at Anfield for two years - but are Reds better?